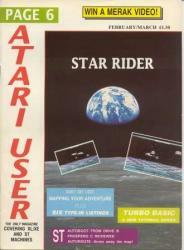 This is another of my old magazine games, STAR RIDER, from Page 6 issue #36. Unbeknown to me until about 6 months ago, was that it was also published in A.N.A.L.O.G. issue #69 which I assume must have been an exchange deal between the two magazines. I can't say this filled me with joy since A.N.A.L.O.G. never paid out the prize money for the 1986 ST programming competition. However they did publish the source code on an issue disk which means I've been able to do this conversion using the original source instead of a disassembly (although my younger self didn't comment the code very well, it might as well have been a disassembly). This is a single chip 16K ROM image and uses analog controls by default. If you want to play it with a digital controller (or the standard controller in digital mode) you can press * to toggle between analog and digital mode. Below is what it looked like in the magazine but with the controls altered for the 5200.
is just too fast for you - you are doomed! 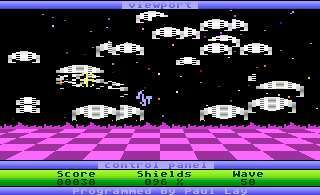 Your planet is being attacked by hordes of alien space craft and it seems you are the last hope of survival. You sit behind the controls of a Surface Runner vehicle which glides over the surface of the planet at an incredible speed. You are protected by a force field and armed with a limitless supply of photon missiles. You are the STAR RIDER. The object is to blast as many of the alien spacecraft as you can, without letting them get past you. Every time you hit an alien your score is increased and your shields are boosted, however when an alien gets past you it zaps your shields making your Surface Runner vehicle shudder. The game is over when your shields have gone. You will find STAR RIDER fast and furious especially at the higher levels, if you ever get that far! Use a joystick in port 1 to manoeuvre the crosshair sights and press the trigger to fire a photon missile. If you manage to survive that far, you will be able to enter your name on the high score screen. Moving the joystick left and right will move the cursor in the appropriate direction and moving the joystick up and down moves forwards and backwards through the characters. When your name is complete, press the trigger and your name will be entered. On subsequent high scores, the name entered appears as a default to save you entering your name each time. Thanks for your work! Looks great! Keep up the great work! Thank you Paul. I'll have to wait to try it tomorrow. Was out drinking all night at my nephews graduation party / dinner ! Wow! This is exciting. I miss the old days writing BBS programs. I downloaded your .bin and will try it out when my AtariMax arrives. Well, this is just a 20-odd year old magazine game, but it was interesting to be able to position the crosshair directly from the controller pots which I was expecting to be too sensitive. When you get your Atarimax SD please try out the ATARI BLAST! demo as this is the on-going project and more exciting (to me) than the old magazine stuff (although I still have one of those left to convert). Finally got a chance to give this a try. I actually did have to find my 5200. We had heavy rainfall and flooding in the area last week, and I scrambled to get everything in the basement away and in the closets and cabinets. Lucky though, no water came in. The controls seem nice and smooth. I only played a quick game, but was only able to hit 3 targets before having lost my shields. I remember this game and typing it in from analog. Thanks for converting it over. It was a lot of fun. You're most welcome. I never imagined I'd be coding on the 8-bit again and to my regret I had not kept anything from back then, so it was nice to find the source code on the issue disk. That is what is cool about this web site. I get to meet people that wrote games I loved when I was a kid. By typing in programs in magazines was how I learned to program as a kid. It was a cheap and fun way to get more video games to play. I typed in as well..Compute Mags for Ti and PcJr. Wish I can find them all on the Web!